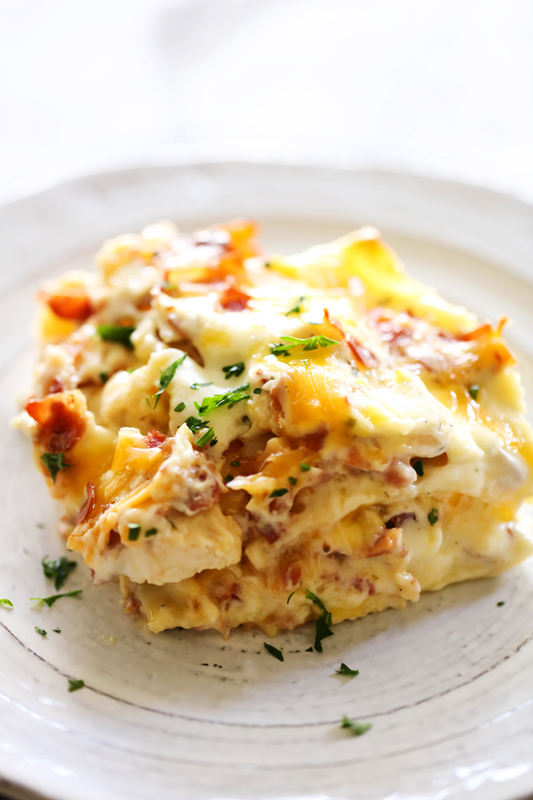 This Chicken Bacon Ranch Lasagna is such a unique and DELICIOUS spin on a classic. It is packed with flavor and yummy ingredients. This will become an instant family favorite and one you want to make over and over again! I am obsessed with lasagnas lately and you guys seem to LOVE when I make a new one. 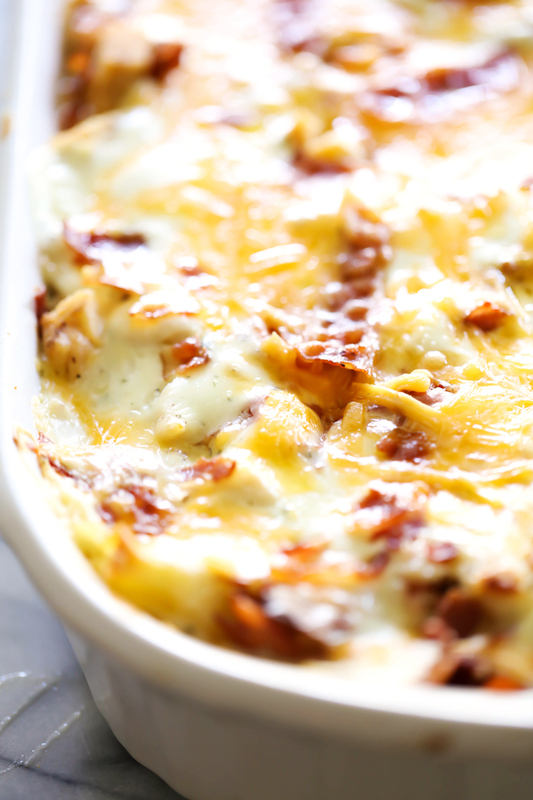 My Chicken Cordon Bleu Lasagna has gone crazy popular since I posted it. For good reason too, it is beyond amazing! That said, today’s recipe is nothing short of spectacular! The flavor and ingredient line up is phenomenal! And best of all, it is picky eater approved! 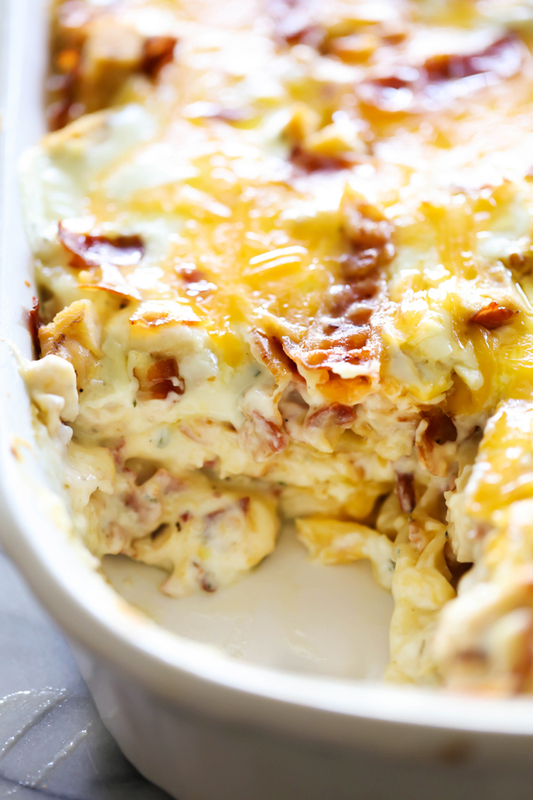 Chicken, Bacon and Ranch were just meant to be together and this recipe soared right to the top of one of my favorites on the blog. The sauce is unbelievably delicious. It is a creamy ranch sauce that only enhances the other flavors of the dish. In a large sauce pan melt butter and add flour. Cook for 1 minute. Add heavy cream, milk, ranch dressing, and bullion. Cook over medium high heat, stirring constantly, until it comes to a boil. Lay 3 noodles on the bottom of dish. Next sprinkle 2 cups of chicken evenly over the noodle. Next sprinkle ¾ cup bacon over the chicken. Next pour ⅓, (about 2 cups), of the sauce over the top of the bacon. Next sprinkle 1 cup of the cheese over the sauce and repeat 2 more times. Bake for 45 minutes or until heated all the way through. Ohhhh man, we came back from vacation yesterday which means I get to COOK again.... And this looks like the perfect thing to start off with! I love lasagna, and would probably go on and on about this too! Is there any way to lighten this recipe up by using less cream? What would I substitute instead, at least for part of it? Is the pasta the cooked kind or the ready to use? Thank you Sweet Jesus for allowing me to come across this recipe. It was beyond delicious. It was EXQUISITE. My whole family LOVED it! Including my picky husband. Going to share some of the leftovers with my friends. I KNOW they're gonna love it too! Thanks once again. Highly recommend everyone try this. I can honestly say that I have never cooked anything that tasted THIS amazing. Everyone at the table was literally savoring every bite. It was painful to eat because it's SO filling, but it's like heaven on earth in your mouth so you just kinda keep bringing your fork to your mouth. Oh man. This will be a fall/winter fave. Great for the upcoming football season- for big groups! THANK YOU FOR THIS!